Operator hygiene and suitable protective clothing to prevent the spread of mite between sites. repeat treatment needs to be undertaken within seven days to maximise the effect and ‘catch’ the largest possible number of mite. Constant vigilance and prompt treatment of any hotspots. 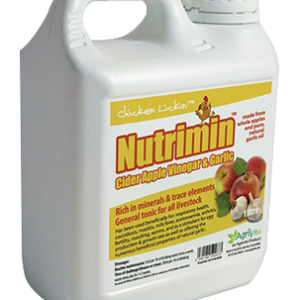 Use of a poultry tonic or vitamin supplement to help the birds recover and increase their resistance to re-infection. THE MITE! – CLEAN AND DISINFECT! 1. Before depopulation of the unit, initially spray liberally with 6% solution of Smite Professional to equipment and nesting areas. This reduces the number of mite initially and gives a more comfortable environment for the workforce. Smite Professional is not licensed to be sprayed on the birds, but it is safe to spray the housing with the birds in situ and any overspray will not cause a problem. 2. Remove all equipment from the unit, including any plastic slats, as these can harbour mite in the joints. 3. The housing unit and equipment should then be thoroughly cleaned and disinfected to a clinical standard, using a 6% solution of Smite Professional. Take care to remove all litter and manure from every area, thus removing as many mites as possible. Pay particular attention to cracks and crevices, perches and joints. 4. Leave all treated areas to air dry and then dust liberally with Smite Organic Powder or Spray to kill any mites and mite eggs which have not been removed by the cleaning process. Pay particular attention to cracks, crevices, perches and nesting areas. Sprinkle liberally over the surface of the litter. 5. When the new crop of birds has been introduced, or the original birds re-introduced, and the unit temperature has stabilised, spray the building and equipment with a 6% solution of Smite Professional. 6. 6/7 days later, spray the whole housing unit again with a 6% solution of Smite Professional and re-apply Smite Organic Powder or Spray to nesting areas, crevices and perches. This will treat any mite eggs which have hatched since the initial treatment. In severe infestations, the treatment should be repeated very 7-10 days until the infestation is under control. 7. Optionally, at stages 3, 4, 5 and 6 Smite Organic Powder can be added to the solution of Smite Professional, if desired, at the rate of approx 20g per litre, and sprayed using a knapsack sprayer. This will combine the separate operations of using both the solution and the powder. When applying Smite Organic Powder as a suspension, care should be taken to agitate the mixture at regular intervals to keep the powder in suspension. 8. A suspension of Smite Organic Powder in water can be applied direct to the birds, if required. COMPLEMENTARY GOOD PRACTICE TO ASSIST IN THE CONTROL OF RED MITE: In addition to the essential ‘full cleandown’ procedure detailed above (which cannot be avoided! ), consider the following, pesticide-free, additional good practices to discourage reinfestation: • There is no substitute for good husbandry! Keep your birds clean, and well supplied with fresh drinking water and food. • Be observant – look for pale faces and wattles, ‘depressed’ birds, lacking vitality, reduced egg production and weight loss – or even weight gain. • Use an essential oil-based ‘Red Mite Repellent’ powder on the birds and in the nest boxes. • Use Smite Organic Powder (a natural mineral product), a very fine powder which can be sprinkled on the litter and in the nest boxes. The grains have razor-sharp edges which shred the mite exoskeleton when they come into contact with it. The mineral is safe for hens to ingest and has beneficial effects on the digestion. • Make sure all poultry housing is regularly treated with a good preservative. • Replace roofing felt with clear corrugated sheeting over plywood or corrugated Onduline sheeting, to remove places for the mite to hide. • In a severe infestation, the housing can be ‘torched’ with a blow lamp, along all the joins and crevices, taking care, of course, to avoid igniting a fire! Mite will explode as the flame touches them. • Remember that brand new housing is vulnerable – don’t be complacent! • Use a good poultry tonic, vitamin, herbal supplement to increase the resistance of the hens to mite attack. • Garlic, either as a supplement added to the drinking water or as a clove placed in the drinker, is widely reputed to be an effective mite repellent. • Cider Vinegar is reputed to have many health advantages, and is often used as a general tonic and mineral supplement, for increased egg production, improved feathering and bone development, increased disease resistance and also decreased attractiveness to blood-sucking parasites. Smite Professional: • Can be used alone as an efficient and powerful Disinfectant Cleaner and De-Greaser • Dissolves waxy coatings and deposits • Is economical and effective! The RED POULTRY MITE, Dermanyssus gallinae, is a very prolific external parasite of birds which can be very difficult to eradicate – partly because the mite can survive for up to eight months between feeds – so they are often in situ, just waiting for the arrival of a new flock! Mites feed largely on blood of the birds, but also on feathers, skin or scales ; each blood feed lasts approximately 1-2 hours after which the mite leave the birds and return to hide in cracks and crevices in the poultry housing, where they lay their eggs, returning to the birds again the following night – hence, it is easy to miss their presence if examining a bird during daylight. Heavy mite infestations in chickens lead to high levels of stress and result in anaemia, reduced egg production and, eventually if not treated, death, so the effects of red mite are of considerable economic importance when considering production costs. Additionally, mite can transmit diseases, such as the chicken pox virus, Newcastle Disease, fowl typhoid and salmonella as well as causing dermatitis and mange. When disturbed, they will also bite interfering humans and can cause a type of dermatitis. At one time it was thought that mite only tended to live in wooden structures, but they are now found on both plastic and metal – anywhere that is as near to their next meal as possible. Nowadays, they are also becoming increasingly common in battery cages, where they cause severe health problems and economic loss. The tiny mite vary in appearance, depending on when they last fed – a mite is only red when it has consumed blood recently and changes colour again through black to grey as the interval between feeds increases. When checking housing areas for mite, a tell-tale ‘grey ash’ around crevices is evidence of mite faeces, but the best time to examine a house is at night, when the mite can often be seen with the aid of a torch, both on and off the bird. Red Mite, in common with lice and other arachnids (spider-type creatures with eight legs) have a waxy exoskeleton (hard outer covering), without which they rapidly dry out (desiccate) and die. One of the best methods of attacking Red Mite therefore is to use a strong degreasant compound which dissolves the exoskeleton and rapidly kills the mite by desiccation. This method has the advantage that it is impossible for the mite to build resistance, a growing problem with many pesticides, and means that the same treatment can be applied repeatedly to keep the infestation under control. Smite Professional is a specially selected, super-strength degreasant, disinfectant cleaner, with excellent wetting properties, which has been proven highly effective at eliminating Red Mite in poultry housing. It is pleasant to use, for both the operator and the birds, is economical and contains no pesticides. 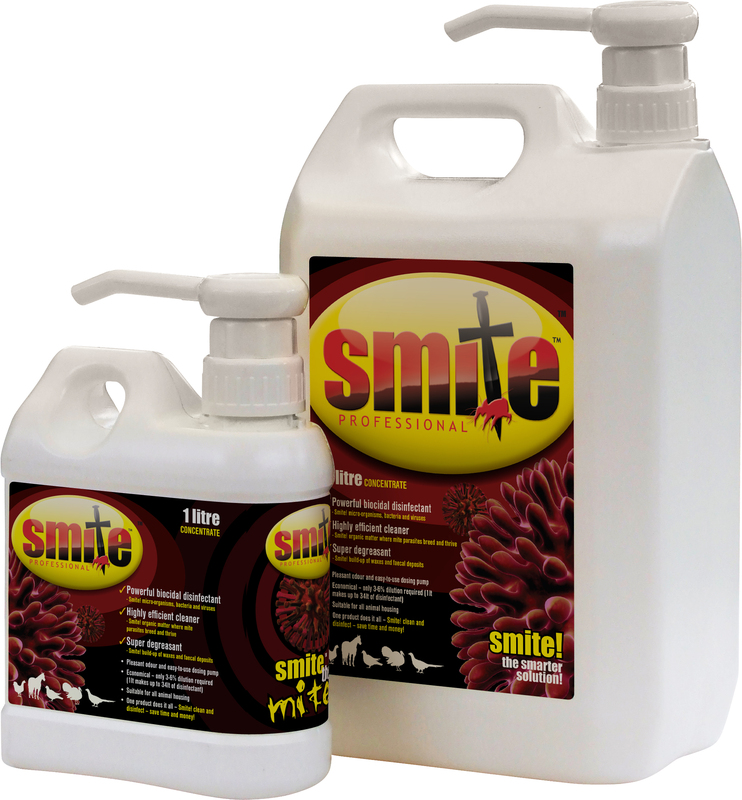 Smite Organic offers a range of products especially developed for the elimination of red mite, lice, flying and crawling insects. These products contain Diatomaceous earth, a naturally mined organic substance. Use in conjunction with Smite professional to form part of the Smite-a-Mite programme. Be the first to review “Smite Professional Concentrate” Click here to cancel reply.